Haven't registered yet? Do so before Friday, May 28 and receive the early registration fee of $50. On May 29, registration will increase to $75. Don't wait! People learn best when they are trying to understand something that directly affects them. The ongoing global credit crisis will shape the business climate that determines your summer internship and post-MBA opportunities. Not only is the ongoing credit crisis of global importance, its quantitative foundations are eminently understandable. I have designed the two-hour quantitative skills workshop at the upcoming Forte Women's Conference like an MBA class in the sense that participants should devote an hour or two of advance preparation using the materials at www.mbamath.com/events/forte.htm so that we can extend and apply that preparation in the workshop. The workshop won't make you an expert but it will highlight the quantitative mechanics underlying bond valuation, financial leverage, securitization, and balance sheet implosions. You'll also get a preview of the quantitative reasoning you'll need in your upcoming MBA classes. 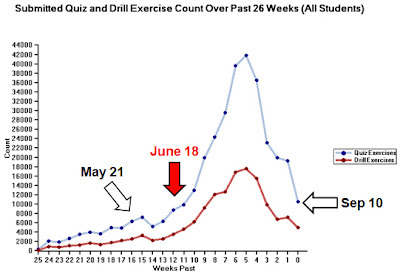 This post and the upcoming workshop come as I preside over an annual summer surge of pre-MBA quant skills preparation at MBA Math, which you can see in the image of last year's activity. Not everyone needs additional quantitative preparation. But for those who do, be aware that your time is limited as you transition back to school and you'll be sitting in fall term classes before you know it. I look forward to meeting many of you at this year's conference. Peter Regan created the self-paced, online MBA Math quantitative skills course and teaches live MBA courses at Dartmouth (Tuck), Duke (Fuqua), and Cornell (Johnson). Preparing to network with companies at the MBA Women’s Conference is more than just brushing up your resume. You also need to practice your “approach”. What is your 30-second pitch? What is the story by which you want companies to remember you? This webinar lead by Caitlin McLaughlin, Vice President - Corporate and Institutional Banking Training at PNC Bank and Former Managing Director at Citigroup will provide tips on networking with companies at the conference and following up with them afterwards. • Follow up—what can you do this summer to enrich future interactions with companies?